The Hilltop Kiwanis Club Scholarship Foundation recently recognized these outstanding students (top from left to right: Jourdin Steele, Shane Wright and Anaemy Danner (from bottom left to right: Julie Russell, Justine Ferko and Brooke Weimer with two-year and four-year scholarships of $1,200 each. Throughout its near seven decades of history, the Hilltop Kiwanis Club Scholarship Foundation has awarded scholarships to more than 300 high school seniors to help them access and achieve their goals at the collegiate level. 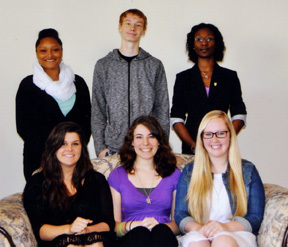 In late April, they recognized six more worthy students to that ever-growing number. Recognized from Bishop Ready High School were Brooke Weimer and Justine Ferko, who received a two-year scholarship and a four-year scholarship of $1,200 per year, respectively. Principal Celene Seamen praised the students for their sound academics and willingness to better the greater community. She cited their extensive volunteer work at the Hilltop library, in the parish gardens and in the environmental club as just a few examples of what makes them standout students and individuals. Weimer says she plans to attend the University of Dayton and study psychology. Ferko, who recently completed her first science fiction novel, said she plans to attend Bowling Green State University and study film production. Recognized from Briggs High School were Julie Russell and Anaemy Danner, who received a two-year and a four-year scholarship of $1,200 per year, respectively. According to school guidance counselor Natalie Billingsley, an educator could not wish for better students than Russell and Danner. Russell, whose older sister Jessica also received a Kiwanis Scholarship several years ago, plans to attend Ohio State University and study physical therapy. Danner, whose mother is a nurse at the United Nations Mission in Liberia, plans to attend Otterbein and major in biology. Recognized from West High School were Shane Wright and Jourdin Steele, who received a two-year scholarship and a four-year scholarship of $1,200 per year, respectively. According to Bill Baker, Wright, who was member of the boys basketball team, is an avid community volunteer who loves to work with children at the J. Ashburn Jr. Youth Center and help build community gardens throughout the area. He said Wright is the rare student who actually enjoys homework. “I could never say that about myself, but that must be why Shane is such a good student,” said Baker. Ron Wilcox said Steele, who was a member of the girls softball team, has a very bright future ahead of her. In addition to being a member of the National Honor Society and a Sunday school teacher, Wilcox said Steele has been an intern at an engineering company and has racked up many awards for her proficiency in the engineering field. “She is truly an outstanding student and person,” he said. Wright said he plans to attend OSU-Newark and study psychology while Steele said she plans to attend Malone University and major in zoology.